WET IS THE WORD: A deep upper trough and the attendant surface low will bring periods of rain to all of Alabama today and tonight; temperatures will be mostly in the 50s. 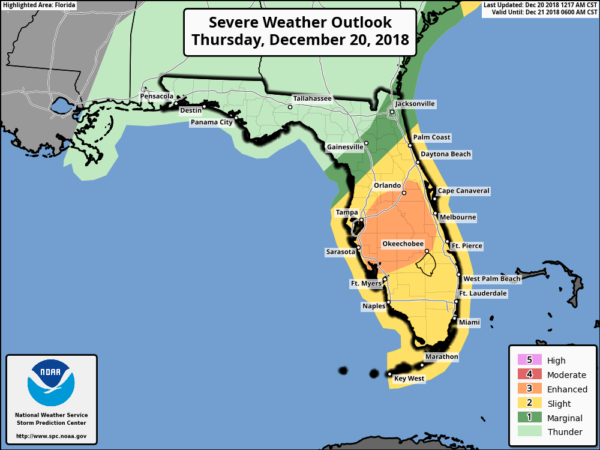 No risk of severe thunderstorms for our state, but parts of Central and South Florida could see some rough weather late today… there is an “enhanced risk” (level 3/5) from Tampa and Orlando south to Lake Okeechobee later today. Rain amounts across our state will be around one inch for most communities over the next 30 hours. Rain will end across Alabama tomorrow morning, but the day will be colder and windy as the surface gradient tightens up on the back side of the departing low. North winds will average 12-25 mph, with higher gusts possible. Temperatures won’t get out of the 40s, and the wind will make it feel colder. The sky will clear tomorrow night. THE ALABAMA WEEKEND: Saturday will be a mostly sunny day with a high in the mid 50s. Clouds will increase Sunday and we will introduce the chance of a few scattered light rain showers during the afternoon with a short wave in the upper air. Sunday’s high will be in the upper 50s. CHRISTMAS WEEK: The weather looks dry Monday and Tuesday with seasonal temperatures; highs mostly in the 50s, and lows mostly in the 30s. 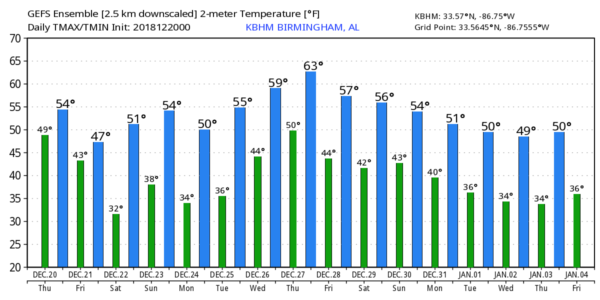 Parts of South Alabama could see 60s Christmas afternoon on Tuesday. Clouds increase Wednesday as winds veer around to the south, and a few scattered showers could break out. Then, rain and thunderstorms are likely Thursday with the approach of a cold front. See the Weather Xtreme video for maps, graphics, and more details. ON THIS DATE IN 1977: A “Once in a Lifetime” wind and dust storm struck the south end of the San Joaquin Valley in California. Winds reached 88 mph at Arvin before the anemometer broke and gusts were estimated at 192 mph at Arvin by a U.S. Geological Survey. Meadows Field in Bakersfield recorded sustained 46 mph winds with a gust of 63 mph. The strong winds generated a wall of dust resembling a tidal wave that was 5,000 feet high over Arvin. Blowing sand stripped painted surfaces to bare metal and trapped people in vehicles for several hours. WEATHER BRAINS: Don’t forget you can listen to our weekly 90 minute show anytime on your favorite podcast app. This is the show all about weather featuring many familiar voices, including our meteorologists here at ABC 33/40. Look for the next Weather Xtreme video here by 4:00 this afternoon… enjoy the day!